These DOCTOR RECOMMENDED laxatives were created from an EXCLUSIVE PROCESS concentrating natural Aloe Vera into a convenient tablet for proven relief of occasional or chronic constipation. Doctors who practice holistic medicine prefer natural laxatives that promote natural bowel movement. 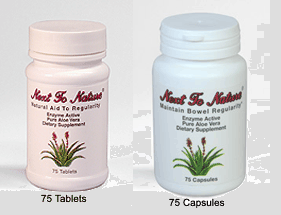 Find out for yourself how fantastic this natural laxative is in relieving constipation. Try it FREE with no obligation! 1. Print out the Sample Request Form. 2. Fill out this form using your US Mailing address.